U.S. regulators have approved a new, more effective vaccine to prevent painful shingles, which is caused by the chickenpox virus. Drugmaker GlaxoSmithKline said the Food and Drug Administration approved it late Friday. It will be the second shingles vaccine in the U.S. market. Merck launched the first one in 2006. Studies paid for by Glaxo found it prevents shingles in about 90 percent of people. Merck's is about 50 percent effective. Anyone who's had chickenpox — nearly everyone over 40 — harbors the varicella-zoster virus that causes the disease. The virus can resurface decades later, triggering painful sores on one side of the body. About 10 to 20 percent of those who get shingles also develop debilitating nerve pain that can last for months, even years. About one-third of people who have had chickenpox get shingles. That's about 1 million Americans a year. But once someone has recovered from shingles, it rarely reoccurs. Chickenpox was a very common childhood illness until a Merck vaccine was introduced two decades ago; it's now part of routine childhood shots. 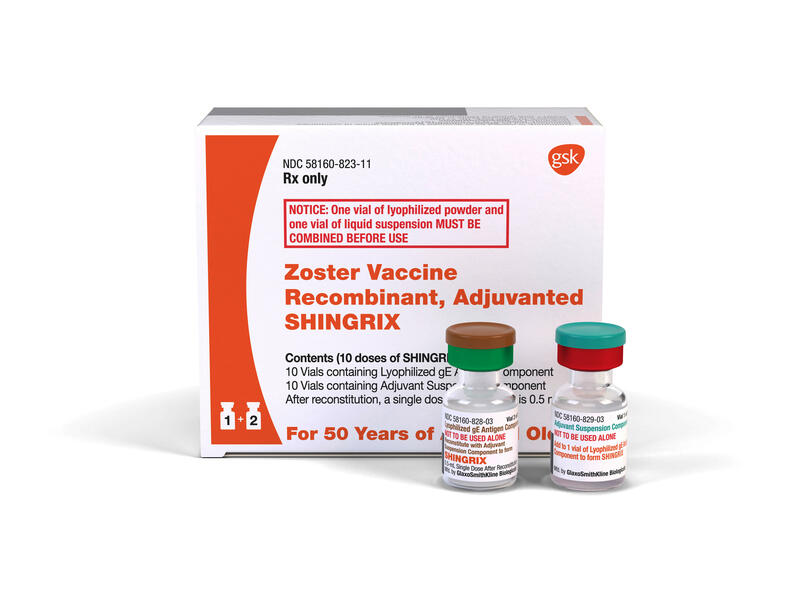 GlaxoSmithKline PLC said the price of its shingles vaccine, called Shingrix, will be $280 for the required two shots. Merck & Co.'s one-shot Zostavax costs $223. Most insurance plans cover it. The two vaccines are made differently. Glaxo's is genetically engineered and includes an ingredient that boosts effectiveness. In addition to preventing shingles, it also reduces the risk of nerve pain by nearly 90 percent. Glaxo studies also show it retains about 90 percent of its effectiveness for four years, and follow-up studies indicate it lasts years longer, according to Dr. Leonard Friedland, Glaxo's vaccines director for North America. Merck's vaccine uses a live but weakened virus, so it can't be used by people with compromised immune systems. It reduces risk of shingles by half and risk of nerve pain by 67 percent, according to the CDC. One study found it doesn't prevent shingles after eight years. More research is being done. Glaxo is testing its vaccine against Merck's. Meanwhile, Merck has been testing a different vaccine on cancer patients and people with compromised immune systems.